Sitting at the core of both your wardrobe and your look (literally), any man who knows style understands the importance of having a diverse array of shirts at his disposal. But when the winds pick up, the chill starts to bite and day-long sunlight becomes a distant memory, your average cotton or linen versions simply won’t cut it. Instead, it’s time to arm yourself with a more robust set of fabrics; here’s our guide to the four cold-weather shirts every man should own. While twill shirts bear more than a passing resemblance to regular dress shirts, they’re much warmer. This is because twill is weaved in a subtle diagonal or herringbone pattern and its threads are more densely packed, resulting in a style that’s work place-appropriate but also delivers ample insulation. Perfect for an office in which the heating may or may not be on the fritz for the duration of winter. A twill shirt might at first glance look like a regular broadcloth, but on closer inspection you’ll see it’s heavier and less transparent. The fabric also makes for shirts that are less stiff and drape a little better – always a plus for flattering body shapes from Johnny Bravo to beanpole. 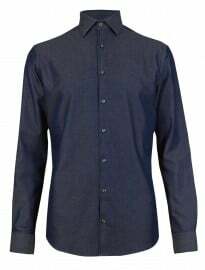 However, it’s worth bearing in mind that a twill shirt can look a little shinier than your average broadcloth, so be sure to offset the rest of your workwear with matte fabrics to steer clear of the disco ball effect. Technically, denim and corduroy are types of twill fabrics, but that doesn’t mean we’re suggesting you rock up to work in your rugged lumberjack best – instead, a garden variety twill shirt in a neutral colour is what you should be on the lookout for. Try a classic white style with French or one-button cuffs and high armholes, or a tab collar design for a slightly more contemporary take on this smart-casual wardrobe staple. Picture a flannel shirt and you probably think of a tough-as-nails, plaid-clad woodsman mopping his brow between axe swings. Which is odd, because in reality flannel is one of the cosiest, cushiest fabrics after cashmere. Made from brushed wool or cotton – the best come in double-brushed wool, once on each side – flannel is the closest thing a man can get to wearing a blanket outside of the house (the Slanket notwithstanding). Flannel has always been synonymous with plaid, but the two aren’t mutually inclusive. That said, it’s a classic combination (and most flannel shirts on offer are checked anyway) so feel free to crest the wave of the ongoing 1990s grunge revival and add a couple to your casualwear rotation. The pattern is available in a staggering variety of colours, but make sure to stick to three shades maximum (two of which should be in the same colour family) to avoid looking like a Dulux colour chart. It’s the flannel shirt’s warmth and versatility that makes it a cold-weather classic; whether you wear it buttoned up with tailored chinos for a smart-casual look, over an undershirt with the collar unbuttoned for a more laid-back take, or – if it’s thick enough – worn open and layered over a thin woollen knit. PS. Forget all negative hipster connotations – unless you plan on wearing yours with some lensless glasses you’ll be fine. 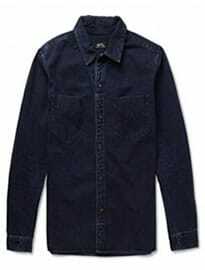 For such a versatile fabric, the denim shirt is deceptively hard to wear – especially in the winter months. Say goodbye to gossamer-thin chambrays and Western shirt silhouettes, only heavy duty denim will do to keep the cold weather out. Conventional fit and denim make bad bedfellows, conjuring up nightmarish images of Canadian tuxedos and down-on-their-luck country music stars in baggy rhinestone-encrusted abominations. The only way to make a denim shirt look truly modern is to go to extremes. Overdyed indigo denim offers a modern update on this workwear classic, and there are always acid washes to have a go at if you’re feeling especially confident. Or, take inspiration from streetwear types and try buying your shirt oversized; the contemporary longline silhouette they rep looks great on taller, leaner body types. Finally, with such a strong, robust fabric, it’s essential you eliminate superfluity. That means no tacky embellishment, no shudder-inducing embroidery – white, black or tonal shirt buttons and simple plackets only. A clean, pocketless silhouette looks especially slick and makes for an ideal layering piece, whereas thicker, stiffer denim styles with chest pockets work best styled as overshirts. 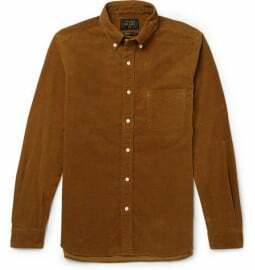 The corduroy shirt is everything that you think it’s not. It’s not rigid and scratchy – actually, quality corduroy is soft and in the same fabric family as velveteen and moleskin – nor is it passé, with brands from Japan (Beams Plus) to Italy (Berluti) offering options this season. It’s also hard-wearing. So hard-wearing, in fact, that even furniture can be upholstered in corduroy. But don’t let that put you off, take these tips on board and you won’t look like a walking ottoman. The raised rib (aka ‘wale’) that makes corduroy what it is can be found in an array of widths, but it’s best to go for a fine, pliable rib (known as needlecord or pincord) if you’re looking for a subtle way of introducing the fabric to your daily getups. Corduroy also tends to look best in earthy neutrals such as beige, brown and navy, or warmer autumnal colourways like brick red, mustard, and olive green, due to its outdoorsy roots. When it comes to styling, go for a Jack Kerouac-inspired aesthetic with an effortlessly-rumpled corduroy shirt teamed with chinos in stone, tan or khaki. Alternatively, go down the workwear route by pairing your shirt with some quality raw denim, a pair of rugged Red Wing boots and an on-trend shearling-collared bomber. Uniqlo does a particularly good line of simple, button-down corduroy shirts with a subtle weave if you’re looking to dip your toe in the trend without committing major cash, while those with slightly more to spend should try J.Crew and the aforementioned Beams Plus, who produce some of the best value for money versions on the market. When it comes to winter shirts, twill is king. 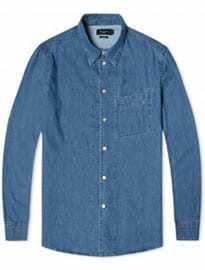 Whether it’s simple twill at the office or more specific, twill-woven fabrics like denim or corduroy in a casual situation, make this heavy-duty fabric your go-to. But don’t forget; flannel will always be a winner when it comes to keeping warm. Which shirts take centre stage in your cold-weather wardrobe? And how do you style them?